For the men and women serving in the United States Military it is hard for them to be away from their loved ones and their homes, but it is even harder for the ones they leave behind. For many, it’s just a waiting game dependent on quick text messages, emails and Skype dates. The choice to be a military wife, fiancé or girlfriend takes patience and strength. Women have to be not only a mother but a father too as their husbands are gone for long periods of time. “ We lead the life of a single parent sometimes, having to take care of the home, family, bills, paperwork and the list goes on. It’s a heavy load sometimes. I feel you have to really love a solider in order to make it as a military wife” said Joeanna Hawley, wife of a Naval officer. The constant distance can put a strain on the relationship but for the men and women that are either deployed or stationed somewhere else, the effect is not the same. 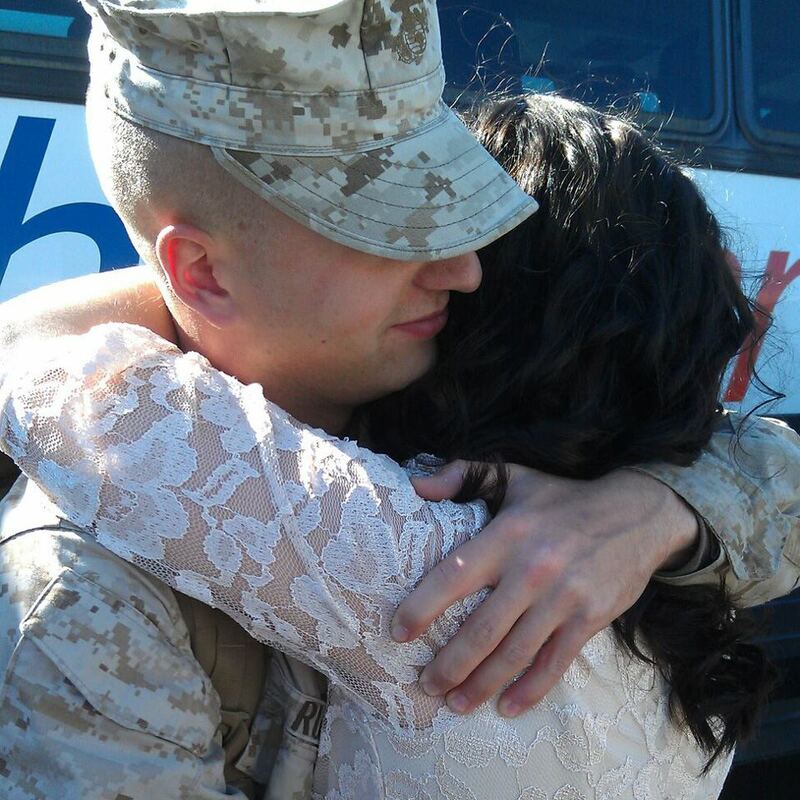 Barrett is stationed in Jacksonville, NC and is scheduled to deploy in about a month leaving his girlfriend behind. For Barrett, it is easier being away from his girlfriend than he believes it is for her. “It’s easier for us on our end, the people in the military, to go day-to-day not seeing the one we love and not knowing when we will see them next because when we’re away we have a mission.” Although they are not deployed, military personnel always have a job to do, and it consumes a vast majority of their days. The hardest part for many is the distance, being alone, not being able to sit down and tell their fiancé or husband about their day. “I didn’t choose this lifestyle, I chose him. This lifestyle just came with him” said Masiello. There are websites and support groups that help the families and friends with the absence of their loved ones and communicate to those who understand what they are going through. Websites such as marinewives.com offer support for women who are forced to live without the men they love. This site encompasses all that is good about the marines while offering a safe haven for women to open up and connect to others on a level that civilians would not understand. For most, they would not change their situation at all. To be in a military-based relationship the women have to look toward the future. Masiello thought about changing it and eliminating the stress in her life, but she said “You get a sense of pride for the person, some days I wish I could change it, the hard days, because I have to live my life alone. I would never change being with him, but I do think if we didn’t have the military it would make things easier.” The military makes it more difficult for relationships regardless of how far away the service men and women are, especially when there is a child involved. “When my husband Dan was overseas I felt like a single parent. When Dan would get back from deployment he would have to get used to civilian life. By the time he adjusted he would have to leave again. So he never would get the chance to realize that I needed his help” said Hawley. Her husband has been home in Waterbury, CT, for a year and Hawley says she still has trouble sharing the parenting because Dan was gone for so long. “ I got so used to doing it on my own. He tries to help but I jump in all the time and try to correct him.” Hawley missed out on the combined efforts of parenting and raising her son Shane for the first two years of his life, but for others, they miss out on many things as well, the little things that are taken for granted. The men overseas miss out on the milestones, a few birthdays and holidays, Barrett explained that everyone has something to miss. Everyone who signs up for the military loses something no matter how big or small it is. “The married guys with kids have it worse. They miss out on being there to watch their kid grow up. Everyone makes sacrifices when we deploy and spend time away from the people and things we love” said Barrett. The women left at home find that they miss the companionship most. “I miss the small things, the little things no one thinks about. To be able to drive to his house when I feel lonely, be able to go to the mall with him and see a movie whenever I want to” said Masiello. The little fights and petty arguments couples face on a day-to-day basis are magnetized by distance. The problems cannot be resolved through a hug or a kiss, according to Masiello, Skype is the only way to communicate and it does not allow the couples to connect on the intimate level that civilian couples can. These blogs will be used to document my work as an aspiring journalist.